Have a weekend away in July, enjoy the 1770 Fresh Seafood Festival on July 28th and then a Tour to the Southern Great Barrier Reef at Lady Musgrave Island on Sunday the 29th July. The 1770 Fresh Seafood Festival will be held on the 28th July 2018 from 10am The 1770 Fresh Seafood Festival will have a range of stalls to choose your favorite way of having your seafood cooked or prepared listening to some local performers and the band Banana Benders. 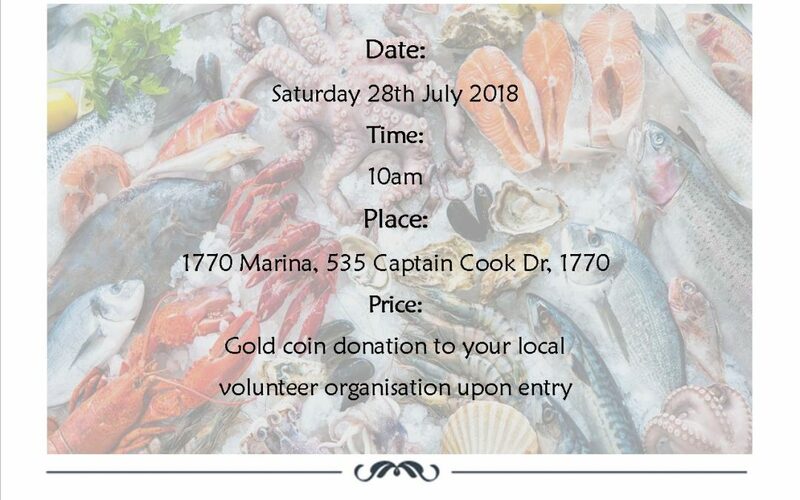 1770 Fresh Seafood Festival is a gold coin donation to your local Community Group. Pick ups will be organised from your accommodation place at certain times and also returns with the local 1770 Shuttle Service. Sunday after a day out at the Seafood Festival why not come to the reef and make the most of your weekend away. We offer a full day tour with all gear provided. Morning Tea, Lunch, Afternoon Tea and Hot beverages are all fully provided to ensure you have plenty of energy to Snorkel with the turtles/ Manta Ray and other Marine Life to explore as well as a Glass Bottom Boat Viewing and Guided Island Walk. This will make a unforgettably fantastic weekend away to enjoy with your loved ones and friends.